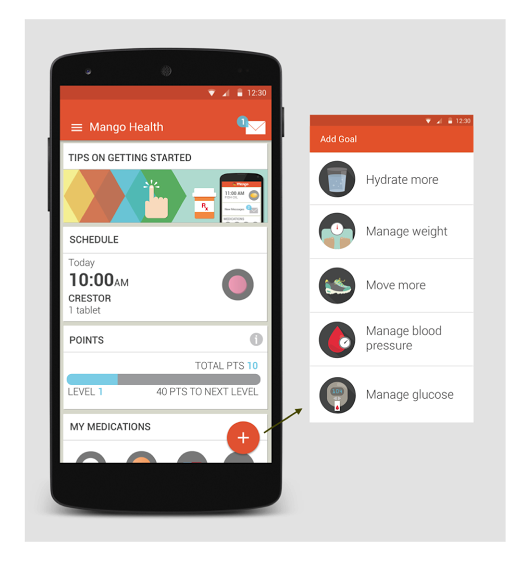 Stacked with execs from the mobile and social gaming industry, Mango Health has been taking the behavioral mechanics that make games addictive and applying them toward more intractable problems in the world of healthcare. Two years ago, they launched a mobile app that helps patients with drug adherence, or whether they’re managing to take their medications every day. Since the the app launched, the company’s been running a yearlong clinical trial with one of the biggest hospital systems in the country, according to CEO Jason Oberfest, who said their partner couldn’t be publicly shared at this time. The total number of participants in the study are small compared to Oberfest’s previous career in mobile gaming, where titles have on the order of tens of millions of active players. They’re also seeing an average of 17.1 sessions a week per user, which indicates that Mango Health’s customer base is probably opening the app at least twice a day. Then the DAU/MAU rate, which is a commonly used statistic in the gaming world that’s for measuring the percentage of monthly active users who come back every single day, is around 77 percent. That means that roughly three-fourths of Mango Health’s monthly users are coming back every day. With those stats, Oberfest says the company is now expanding its focus into overall health and beyond just drug prescription adherence. Mango Health targets that “Farmville demographic” that Zynga and other gaming companies used to go after in the late 2000s — basically middle-aged women. They’re expanding the app to track hydration, physical activity and then glucose and blood pressure monitoring. They’re also bringing an app to the Apple Watch. While I’m hesitant about strapping even more distracting app notifications to myself through a wearable, health and wellness is an area where it absolutely makes sense. Taking pills, drinking water or being reminded to move because you’ve been sedentary for too long are low-touch activities that a wearable feels well-designed for. The app will send notifications on times when it’s necessary to take your medication, and present graphs on how well you’re adhering to your prescriptions so far.